OK, ok. I'll put it to you straight. "At Least Like Melissa" is now featured on a compilation CD that the wonderful FINGERTIPS MUSIC has put out! The CD is called "Fingertips: Unwebbed" and is a collection of 13 songs from 13 of the BEST independent artists featured on the Fingertips Music site during it's first three years of existence. Read more about the CD here and for online liner notes go here. I'll hopefully put a picture of the CD up here soon. The gig went great. At least David thought so. I thought it was OK but had some trouble with technical stuff… My vintage Japanese distortion (I call it Kamikaze distortion) decided to NOT WORK in the third song… I forgot to put the capo on the right fret… When I was to restart the song my digi porta didn't want to re-start… … … So A few words got lost in the beginning of the last song… Overall people said they liked the show a LOT. My friends said that the sound wasn't that good - the backtracks MUCH too loud which kind of buried the vocals in the soundscape… One good thing was that I sold ALL my demos!!! I only brought "wolflike they are" but now they're all gone so I have to fix some new ones for my next show! 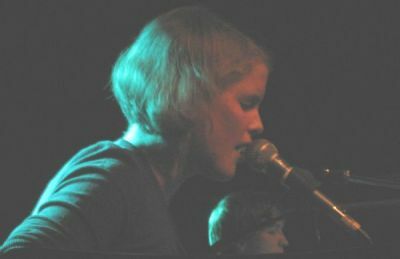 One of the people in the audience - Viktoria - AKA Mangobruden - posted a blog about the Juliana Hatfield show and she mentioned me as well. She took this picture and if you click it you can read what she had to say about the show (in Swedish). Sara Culler was the support act. It sounded good. If I were to categorize her she would end up somewhere in-between Frida Hyvönen and Anna Ternheim. This will maybe become something. A pleasant listening. Juliana her self was REALLY nice. She gave some great inputs about the music business - She's been around a LONG time so I HONESTLY respect her. I haven't really listened to her solo stuff that much. I borrowed "Become What You Are" a few times at the library. She gave me her new album and her address so that I can send her my music. I'll be listening to it today! This coming week there may be a possibility that I'll be posting a LOT of news!!! So after thirteen years of desperate longing I finally got to see Yo La Tengo yesterday! The thing is that I've missed them every time they've visited Malmö… But now -finally! They played a two hour set with an amazing blend of old and new. I haven't heard that much of the new album but MAN! AMAZING albums like "May I Sing with Me", "Painful", "I Can Hear the Heart Beating as One" and "And then Nothing Turned Itself Inside-out" + various cassettes have been triggering the musical part of my brain since I was 15 years old. NO band has the dynamics and the skills to master such a wide variety of musical forms and figures as Yo La Tengo. The nostalgic and soft "drone-ish" songs counter the punk and sharp-edged counter the pure pop yet keeping mind-blowing melodies and harmonies all the way through! Captivating!!! - "The last request came from somewhere over here and pointed towards me"!!! THEY freakin' played my request!!!!!! Detouring America With Horns!!! When I arrived at the coffee date I was all jittery - like a teenager - star struck ;O) Just like the good old days when you allowed yourself to completely and excessively worship and devote yourself to music in that shameless kind of way! I'll try to stick to that feeling. You are as old as you make yourself and I intend NOT to get older for some time… Right now I am seventeen again!